Baseball, as we know, is a game without a clock. Well, except for the pitch clock, a good idea that’s poorly enforced. And, sadly for me, there's the strongly enforced clock that limits my opportunity to tenure on the Hall of Fame voting panel to 10 years after leaving sports writing. This is my sixth year as an "Honorary" voter, marking the first time I'm closer to the end of my tenure than the start. 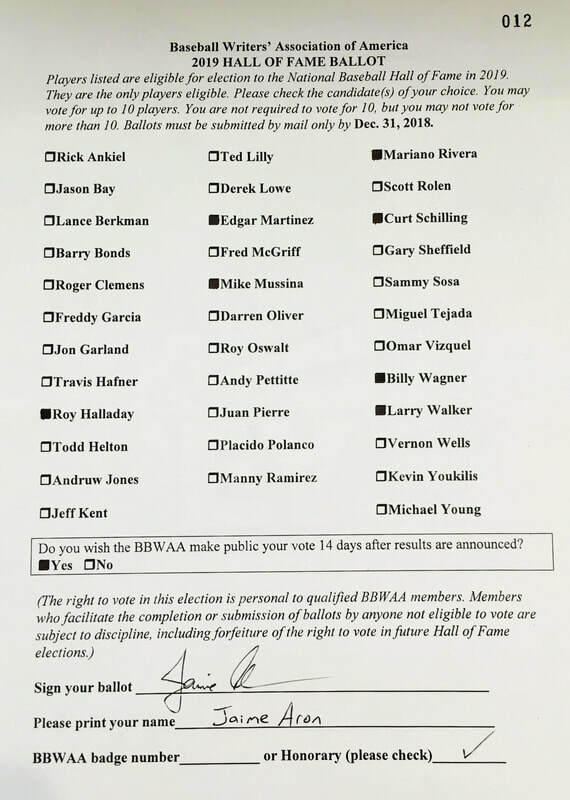 Put another way, I'll never get a chance to vote for Adrian Beltre, Joe Mauer and anyone else who retires from here on out. The flip side is that it makes me put even more effort into these remaining ballots. So, here we go. Congrats to the following seven gentlemen who are each one vote closer to joining the Class of 2019. My 2017 email explains the thought process behind Edgar and Mussina, 2018 for Walker. Then there's Schilling. I've voted for him since his second year on the ballot. While I wouldn’t want to hear his induction speech, my disgust over most things he supports doesn't alter my belief that he was Hall-worthy on the mound. Duh. But a good opportunity to explain my first-ballot stance. HOF membership means you were among the greatest players of your generation. But how can we further illuminate the best of the best -- the players so good that the story of their era couldn't be told without them? To me, that's the first ballot. I also frame my stance this way: You don't have to be among the handful of players on a greatest team of all-time (that's too high of a bar), but you do have to be among the handful considered from your generation. I struggled with this choice. I didn't want to be swayed by the emotion of his death, but also didn't want to overcompensate. (And, as with Schilling's politics, the circumstances around his death have no bearing.) I also wasn't sure whether he cleared my first-ballot bar. I mean, I love the fact he threw a no-hitter in his first career playoff game. And I love every aspect ofthis SI profile of how he became so dominant and maintained it. What clinched it was the sense that he'll go down as the end of an era, the last of the workhouse power pitchers. This isbest expressed in innings and starts. However, the metric that sets him apart is complete games. He led the league (first AL, then NL) 5 years in a row, 6 of 7, and 7 of 9. He averaged 8 CGs in those seasons. Last season, the Cleveland Indians had 5 CGs - and they practically lapped the field; no other club had more than 3. Yes, it's a different game in just the five years since he retired. That's my point. And before you note that his predecessors routinely averaged a LOT more than 8 CGs … well, that's my point again. By his generation’s standards, he dominated, enough to earn my first-ballot support. This one was tough, too, in part because he doesn't stack up so well to other HOF relievers. However, I'm again factoring in the changing game, which means it's silly to compare him to the Goose Gossage, Rollie Fingers and Bruce Sutter types who routinely went multiple innings. I've long been a proponent of closers in the Hall. I supported Lee Smith for years in hopes of acknowledging that era in the gap between Goose-Rollie-Bruce and Mariano-Trevor Hoffman. Now that Trevor is in and Mariano is going in (and Lee Smith, too, coincidentally), I believe Wagner belongs in Cooperstown's bullpen. There's a lot to like on hisstat sheet, especially his 11.9 Ks/9 innings, the best among pitchers who threw at least 500 innings. Many of his numbers are awfully similar to Hoffman. Billy gets bonus points for throwing so hard while being so short and bonus-bonus points for doing it all left-handed despite being a natural righty. YOU CAN VOTE FOR UP TO 10. WHAT ABOUT THE 3 REMAINING SLOTS? I pondered many of the solid candidates on the ballot. But is solid worthy of Cooperstown? Yes, that was a setup for a jab at the selection of Harold Baines. You can read elsewhere about the cronyism that got him in. To me, the question is whether Baines’ selection by the Today's Game committee should change the way I view a HOFer. That is, should I lower the bar? If so, Fred McGriff would clear it easily, while Scott Rolen, Todd Helton, Jeff Kent and Andy Pettitte would be under closer consideration. That said, I'm a fan of the oversight committee concept. Have to be considering my support of Jack Morris, Alan Trammell and the aforementioned Lee Smith, who needed this second chance opportunity to get in. Here’s hoping the curious decision on Baines prompts the process to be refined, not eliminated. I've gotten this far without mentioning Bonds, Clemens and such. Years ago, I expected to soften my stance and support them by now. Still hasn’t happened. Still can't see them in that room on Sunday night. Thanks for reading all the way to the end of my annual indulgence. Feel free to reply with your thoughts. Happy holidays and best wishes for 2019.